18 August 2015, at 6:00a.m. Three articles published in this month's issue of Poultry Science focussed on the effects of different colours and types of light in poultry production. What can the latest research tell us about how best to light poultry barns? Why are lighting characteristics important? Light is of central importance in poultry production, as producers want to provide optimum conditions for the birds to reach their full genetic potential. Factors such as light intensity, organisation of light-dark cycles (the photoperiod), light source type and the wavelength of light are all worth considering. Photoperiods and light intensity have been thoroughly investigated, but there is less research on the benefits of different light sources and wavelengths (colours). Some previous research indicated that blue light had stress-relieving and growth-promoting properties in chickens, but there were concerns over whether visual information was missed by the chickens under light of a single wavelength. In addition, other studies found that red light had a promotional effect on egg production, leaving a confusing picture over the most effective light to use. Birds have different light perception systems to humans, as they are able to see into the UV range as well as our visible spectrum, and they also have light-sensing receptors in locations other than the eyes. The light information received by the birds' brains is important for regulating metabolism and the immune system via changes in hormone levels. Do broilers prefer 'warm' or 'cold' coloured light sources? One of the studies, by Anja B. Riber, tried to identify the effects on behaviour, welfare and performance of two different types of LEDs. 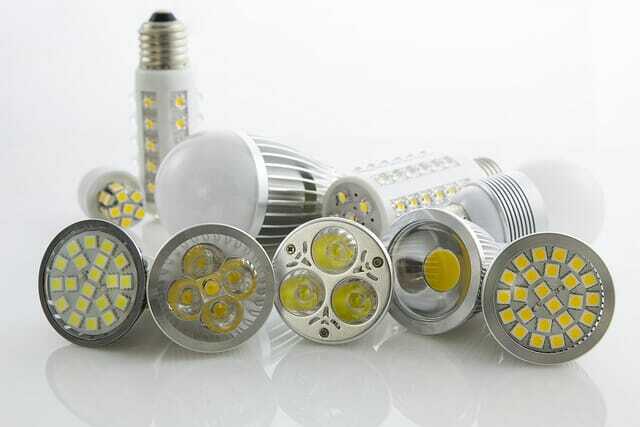 LEDs, short for Light-Emitting Diodes, are energy saving alternatives to the more commonly used fluorescent lights in poultry houses. Unstable energy prices and the increasing emphasis on sustainable production methods provide strong incentives to use such devices. They also have a long usable life, reducing maintenance and replacement costs. The study looked at the effects of two LEDs of different 'colour temperatures', measured in Kelvin (K). This term is an indication of the colour appearance of white/yellow light sources, with warmer-looking colours having cooler colour temperatures and vice versa. Two colour temperatures were used in poultry houses in the study. The 4,100 K light is known as 'neutral-white', and it is close to the colour temperature of the light sources typically used in Danish broiler houses. The other light source, with a colour temperature of 6,065 K, is known as 'cold-white', as it contains more light of wavelengths from the blue part of the spectrum. This light was chosen as it resembles the colour temperature of natural daylight on an overcast day in the tropics and, therefore, seems to be the natural choice of an ancestor of modern chickens. The study looked at the broilers' preferred light colour by allowing them to choose between compartments with each different light source. They spent more time in the cold-white light, which contained more blue light, and performed more relaxed behaviour whilst in that compartment. However, the preference was not seen as particularly strong by the author, as the birds did not spend more than 56.2 per cent of their day in the preferred colour compartment. Whilst previous studies showed a positive impact of blue light on aspects of poultry welfare such as fear and aggression, the present study showed more sedentary behaviours under the light source with more blue emissions, which could lead to more leg problems. When reared in the cold-white light, birds showed higher body weight at slaughter age, but without negative effects on other measured parameters such as lameness or dermatitis. The authors concluded that the colder-coloured light was more optimal for broiler performance, given that they slightly preferred this colour and body weight and breast muscle yield was increased in birds reared under these lights. Does light colour cause stress in broilers? Another study in the same issue of Poultry Science, by H. A. Olanrewaju and colleagues, looked at the effects of colour temperatures on blood characteristics of broilers grown to heavy weights (>3 kg). The study used blood properties as a measure of bird health and welfare, as it can reveal early symptoms of disease and show whether birds are stressed. The 4 treatments the birds were raised under consisted of 3 LED light bulbs of varying color temperatures: 2,700 K (Warm-LED), 5,000 K (Cool-LED-#1), and 5,000 K (Cool-LED-#2) and standard 2,010K incandescent light (ICD). Cool-LED-#1 light bulbs resulted in different blood characteristics of broilers compared with the standard incandescent light bulbs. The researchers found increased partial pressures of carbon dioxide and decreased partial pressures of oxygen under the Cool-LED-#1 treatment, as well as decreased pH. The authors speculated that this might be due to acute respiratory acidosis, as in a previous study looking at the same birds, they found that birds under the Cool-LED-#1 light bulbs had significantly larger body weights, and therefore they may have been unable to ventilate sufficently. This would result in the observed insufficiency of oxygen and an overabundance of carbon dioxide in the tissues. However, measurement of hormones in the birds indicated they were not stressed, and the authors also suggested several other explanations that may account for these differences. The authors concluded that these blood measurements could be compared with other future studies to set a standard for what birds' blood values should be, in order to maintain optimum health and welfare. How do blue and red lights affect duck farming? There has been a lack of research into how work on lighting in chicken and turkey farms translates through to duck production, and this is what the third study, by C. L. Campbell and colleagues, set out to do. That study compared ducks reared in conventional barns under three different wavelengths of light: red light (approximately 625 nm), blue light (approximately 425 nm), and white light. The scientists weighed the ducks, scored them for body condition, took blood samples for hormone analysis, and looked at the carcass conditions at the end of the study when the birds were slaughtered. They also took hours of video footage of the ducks, and quantified their different behaviours such as feeding and preening. Ducks raised under red light showed much less activity compared to ducks under white or blue lights, and in some weeks of the study, ducks under blue light showed extremely high levels of activity compared to the other 2 light treatment groups. The ducks reared under blue lights fared worse in terms of body weight than those under red and white lights, at every age measured. Although the birds had similar carcass yields, those reared under the blue lights had a lower percentage of breast meat and a higher percentage of skin and fat in the carcass compared with ducks reared under red and white light. The increased activity and observed increased corticosone hormone levels in the ducks under the blue lights suggested increased stress levels in these birds, the authors said. This shows that blue light may have the opposite effect in ducks to in broilers, as broilers responded to blue light with increased growth and reduced stress. The scientists suggested that these increased stress levels may have caused the reduction in carcass quality seen in the ducks reared under blue lights. The authors conjectured that the increased stress under blue light may be down to the fact that ducks tend to use blue plumage as signals of reproductive strength during the mating season. Chickens and turkeys, on the other hand, use red pigments to show their social hierarchy. This evolutionary difference may also account for the different responses seen to light colour in broiler and layer (male and female) chickens. The scientists concluded that blue light was detrimental to duck farming, and that while red light may have some benefits for ducks in terms of reduced activity, this did not translate to higher quality carcasses, so the white light was best overall. Anja B. Riber: Effects of color of light on preferences, performance, and welfare in broilers. Poultry Science (August 2015) 94 (8): 1767-1775. H. A. Olanrewaju, J. L. Purswell, S. D. Collier, and S. L. Branton: Effects of color temperatures Kelvin) of LED bulbs on blood physiological variables of broilers grown to heavy weights. Poultry Science (August 2015) 94 (8): 1721-1728. 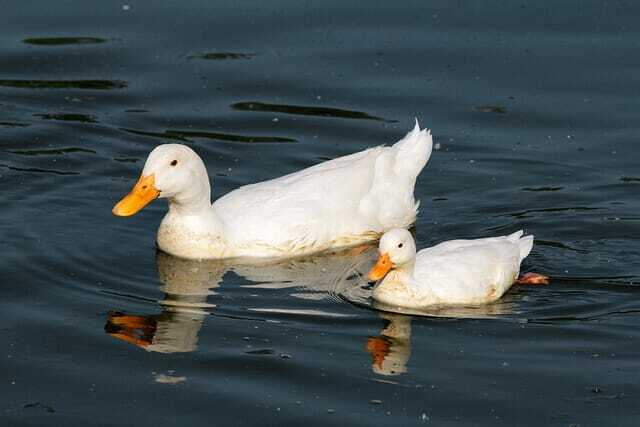 C. L. Campbell, S. Colton, R. Haas, M. Rice, A. Porter, A. Schenk, A. Meelker, S. M. Fraley, and G. S. Fraley: Effects of different wavelengths of light on the biology, behavior, and production of grow-out Pekin ducks. Poultry Science (August 2015) 94 (8): 1751-1757.